The story of Anne Boleyn has been told often in books, movies and TV programs, but none come close to the life she actually lived – her life told by Eric Ives. 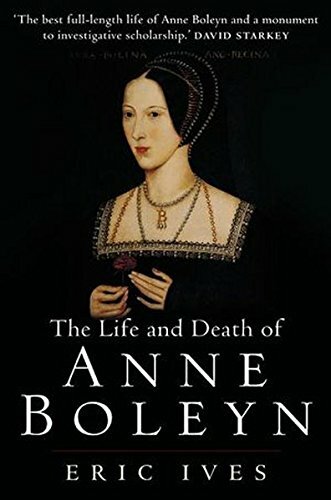 This definitive biography of Anne Boleyn establishes her as a figure of considerable importance and influence in her own right. A full biography of Anne Boleyn, based on the latest scholarly research. Focusses on Anne’s life and legacy and establishes Anne as a figure of considerable importance and influence in her own right. Adulteress or innocent victim? Looks afresh at the issues at the heart of Anne’s downfall. Pays attention to her importance as a patron of the arts, particularly in relation to Hans Holbein. Presents evidence about Anne’s spirituality and her interest in the intellectual debates of the period. Takes account of significant advances in knowledge in recent years. Most translations of Anne’s life leave her as either a vindictive mistress or a woman ahead of her time who was wrongfully executed. It is easy to choose one side or another but in real life there were no winners. Anne Boleyn died unnecessarily, Katherine of Aragon died of what some believe was cancer (or maybe a broken heart) and Henry VIII would go through many more wives and eventually go down in history as the man who divorced or beheaded a majority of his queen consorts. This book reads are very fact based with bits of Ives opinion in places. I’ll admit, it isn’t the easiest read but it is definitely full of useful information for anyone who wants to know the truth about Anne Boleyn. One must remember when reading this book that the information obtained by Ives is contemporary, for the most part. There are references to his sources throughout the book and there is a plethora of notes to back up the facts listed. There are pages upon pages in the bibliography and an index in case you want to look up something quickly. It may seem strange, but one of my favorite parts from the books is when Eric Ives talks about the portraits of Anne and explains which he believed to be the most accurate of the Anne portraits. It is the best explanation that I have read so far. You’ll also learn interesting bits about Anne that you do not normally find in everyday blogs written about her. As an example, Anne’s involvement in the building of castles during her time with Henry. This was something that I was unaware of. If you love the story of Anne, or better yet, if you are obsessed with her daughter, Elizabeth, please take the time to immerse yourself in this book. I’ll have to go back and read it a few times and highlight sections so I don’t forget the important parts. Well worth the read! I’d definitely give this book five out of five stars.